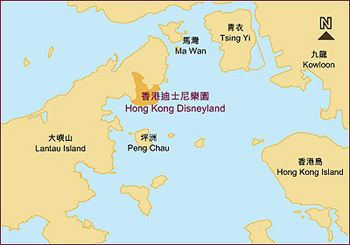 Government and the Walt Disney Company entered into an agreement in December 1999 to build and operate Hong Kong Disneyland at Penny's Bay, Lantau. The two sides have set up a joint-venture company called Hongkong International Theme Parks Limited for this purpose. Opening on 12 September 2005 , the Hong Kong Disneyland is the first Disney theme park in China . It heralds a new era for tourism in Hong Kong and helps Hong Kong reposition itself as a premier destination for family tourists. Before setting off their journeys, visitors to the Hong Kong Disneyland should plan their trip in advance and check the traffic and ticketing situation through such channels as media broadcasts, website and telephone enquiry line ((852)1830830). Visitors from the Mainland are advised to use Lo Wu Control Point and stay at least one day before and after visiting the theme park to avoid the cross-boundary peak hours.